Metal Craft Docks is celebrating 80 years of manufacturing the best aluminum boat docks on the market! The Metal Craft Company was formed in Cleveland, OH in 1932 by two German metal fabricators and engineers. They began building docks in the late 1930’s with popularity gaining in the mid – 1950’s. The first commercial installation at Camp Mission Meadows in 1957 on Chautauqua Lake in New York was just the beginning for this growing business. The dock design evolved rapidly and Heavy Duty Floating Docks were first installed in the early 1960’s. We are proud to say that the stationary docks at Camp Mission Meadows are still in use today. Metal Craft Docks also has a long history in salt water applications from Maine to Florida. 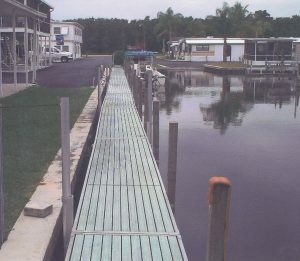 A 67 slip marina installed at Everglades City, Florida in 1979 is still going strong, too! The second owner of The Metal Craft Company came on board following the death of the founders in 1978. Metal Craft Docks, Inc. was formed in 1991 with the purchase of the assets and equipment of The Metal Craft Company from this second owner. 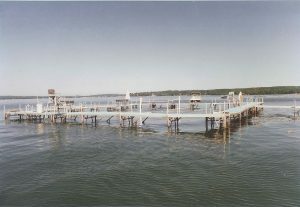 The company’s product line was expanded in the 1990’s with the addition of a new Lightweight Floating Dock System, an upgraded commercial Heavy Duty Dock System, an improved Stationary Dock System, and an upgraded Stair System. The company’s product line was further expanded in 2005 with the addition of six new Boat and PWC Lifts. In April, 2011 MC Docks, LLC was formed with the purchase of the assets and equipment of Metal Craft Docks, Inc. and the company moved from Chardon to Mentor, Ohio. The company continues to manufacture the same quality aluminum products with very few changes to the original design. Whether your system is months old or 80 years old, we still make the parts and accessories! In 2015 Metal Craft partnered with exceptional vendors, Jif Marine and Lake Lite, increasing the accessory product line for Metal Craft Docks. Metal Craft is excited to continue designing new products and partnering with other marine brands to bring you the best quality on the market. Metal Craft Dock & Lift Systems are distributed through a network of factory authorized dealers in 14 States including Connecticut, Florida, Illinois, Indiana, Kentucky, Maryland, Massachusetts, Michigan, New Hampshire, New York, Ohio, Pennsylvania, Virginia and Wisconsin. Sales to the other 36 states and Canada are handled factory-direct. New Factory Representatives and Dock Dealers are welcome. Metal Craft manufactures all of its products at its facility in Painesville, Ohio. Quality and cost is carefully controlled; Metal Craft is a privately owned business – no corporate overhead. Metal Craft does not try to compete against lower value alternatives; We compete against ourselves every day to design and manufacture the best boat docks available on the market. When you purchase a Metal Craft product, you are purchasing a product that will never have to be replaced due to regular use or weather – it will last for decades into the future! Metal Craft is a registered trademark of MC Docks, LLC.